iBall has released a new smartphone in India, named as iBall Andy 4D1+. The smartphone priced at Rs.6, 399 and it now listed on iBall official site for sale. 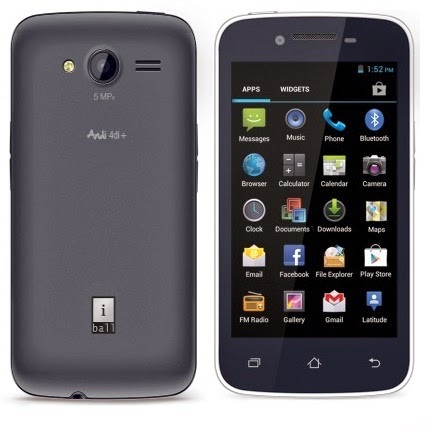 Andy 4D1+ is an upgraded version of iBall Andy 4D1, design also looks same. iBall Andy 4D1+ comes with 4-Inch WVGA touchscreen with IPS technology and 480x800 pixel screen resolution. It support dual-SIM card with dual stand-by. The device runs with Android v4.2 Jelly Bean operating system and powered by dual-core cortex A7 processor with 1.3GHz clock speed, 512MB of RAM installed. Andy 4D1+ packed with dual cameras, 5MP rear facing camera with LED flash and VGA front camera. It has 4GB of in-built memory and it expandable up to 32GB using Micro SD card slot. The device features connectivity options through 3G, EDGE, Wi-Fi, Bluetooth, GPRS, and GPS. Its stand-by managed by a 1,700mAh battery.